On March 31, at another rally in Ghaziabad, Adityanath referred to the armed forces repeatedly to draw a contrast with “Congress ke log”. 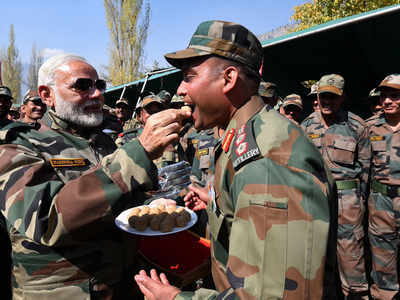 Said he, “Congress leaders would feed biryani to terrorists but Modiji’s sena only gave them goli and gola.” This graceless description of the armed forces as Prime Minister Modi’s private army and crude depiction of counter-terrorism operations are an attempt to politicise our forces. The Opposition raised the red flag even as retired Generals and other foot soldiers of the services condemned the crass politicisation of an apolitical institution despite the Election Commission’s (EC) stricture: “Political parties/candidates/campaigners should desist from indulging in propaganda involving activities of defence forces’ (presumably military operations).” But all the EC did was to issue the Chief Minister an advisory of caution, so toothless is the commission. The Chiefs of Staff Committee of the three service Chiefs ought to have condemned Adityanath’s remark. Just last month, Gen Angus Campbell, Australian Chief of Defence Staff, intervened in an interaction between his Defence Minister Christopher Pyne and soldiers, ticking off the Minister for raising a political issue. Though Singh pretended that none of the Adityanath theatre happened till four days later, he spoke up, especially after the EC issued a notice to the Chief Minister for his offending comment. Singh said, “Those calling the Indian Army Modi’s sena were not only wrong but also traitors to the nation.” He added that he did not know the reference and context of the controversial remarks by Adityanath. Never in the history of independent India has any Government milked the “military operations” of the armed forces for political or electoral gains as blatantly as the ruling establishment does. Prime Minister Modi inaugurates his campaign speeches with “Mere saath bolo: Sena ki jai” sloganeering. Further, BJP leaders have openly stated that they would exploit military achievements despite the EC’s ban. After the surgical strikes in 2016, BJP president Amit Shah said that it would be used in the Assembly polls in Uttar Pradesh and other States — and they were. While speaking to party workers in Mumbai last month, External Affairs Minister Sushma Swaraj indicated that the Indian Air Force (IAF) strikes on terror camps in Pakistan would be an issue for her party in the Lok Sabha poll. She said that her party would come out with two leaflets — one containing initiatives of her party for welfare of women and the other countering the Opposition regarding Balakot air strikes. The Government’s glorification of the armed forces is a welcome step but not when the real motive is not their deification but that of the political leadership enhancing its own image. The Government’s claims of caring for the soldier and the military are highly exaggerated, merely through symbolism and lip-service: Rakhi-tying for soldiers in Siachen or Modi spending Diwali with ITBP soldiers. With four defence Ministers in five years, lowest defence budgets since 1962, stinging rebukes on operational preparedness and defence modernisation by the Standing Committee of Parliament on Defence and the Estimates Committee by the BJP’s own veterans, Maj Gen Khanduri and MM Joshi, no less, everything indicates a muddle in the higher defence management. At a CNN18 programme last month, Defence Minister Nirmala Sitharaman ducked awkward questions on an imperfect One Rank, One Pension scheme and the Government blocking Non Functional Upgrade (NFU) for the armed forces. Defence reforms, including CDS, have not moved an inch. Making national security a poll plank is like shutting the stable door after the horse has bolted. Systematic efforts have been made at politicising the military starting with the post-Uri surgical strikes. Brazenly, the BJP unfurled banners and posters containing pictures of the Director General Military Operations, Lt Gen Ranbir Singh, flanked by Modi and Shah in Lucknow and Uttar Pradesh. Modi was hailed the invincible conqueror and so on. Former Defence Minister Manohar Parrikar, an RSS pracharak, would tell stories about how he infused the Hanuman spirit in the Army (Yogi Adityanath has also likened the Army to Hanuman). Lt Gen DS Hooda, now retired, the chief architect of the surgical strikes, said: “We should have kept the operation under wraps and not let it get politicised.” The BJP has squeezed the last drop of electoral juice from the surgical strikes in every Assembly election in 2017-18. In Karnataka, Modi targeted Nehru for shabbily treating one of the two Coorg military icons, both army Chiefs, KM Cariappa and KS Thimayya, though he got the wrong General and made matters worse by injecting politics into a class of Coorg nobility which has been historically apolitical. The political antics over Balakot have outclassed surgical strikes. Modi excelled himself by describing the air strikes graphically with pictures of Abhinanadan in the background till EC’s notional prohibitory orders. Each BJP campaigner is competing to outdo his own party rival in lavishing praise on Modi’s mythical powers of leadership. The BJP is drunk on its Balakot brew, refusing to either ponder on Pulwama or Balakot and beyond. The two military operations of the IAF and the Army may win the BJP another term in Government but will dangerously politicise the secular and professional armed forces.